What do the Pottstown High School Classes of 1962, 1979, 1982 and 1991 have in common? They all have classmates who have been nominated for inclusion in the 2018 Class for the Pottstown High School Alumni Honor Roll. Aram Ecker, chair of the Alumni Honor Roll Committee placed the names of James R. Bush, Theresa Rinaldi, Jonathan C. Corson and Heather M. Thiret as the nominees for this year’s class to the Pottstown School Board on Thursday April 19, 2018. 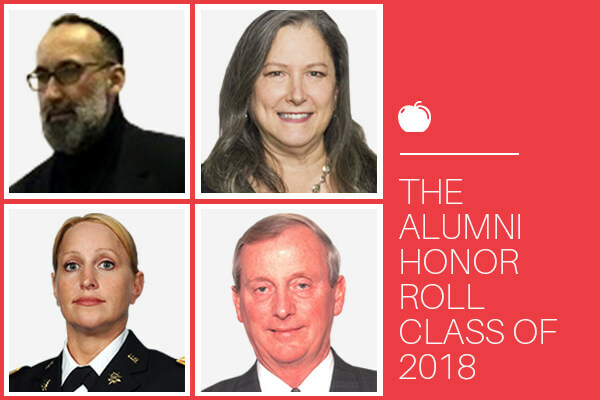 The four honorees will be recognized at the Annual Alumni Honor Roll event on Friday October 19, 2018. The event will begin with a continental breakfast at the Pottstown High School followed by a tour of the Alumni Gallery. The recognition ceremony will be held during an assembly in the High School’s Stanley Davenport Auditorium. The induction ceremony will be followed by a luncheon at the Brookside Country Club. Members of the community as well as all Pottstown High School Alumni are welcome to the event. Tickets for the luncheon will be on sale beginning in August and can be reserved by contacting the Foundation for Pottstown Education or the Superintendent’s Office. After graduation in 1962, James R. Bush served in the U.S. Army Reserves and attended Peirce Junior College earning his Associates Degree in Accounting in 1970. Jim then earned his Bachelor’s degree in Business Administration from Ursinus College. From May of 1964 through September 1968, he worked as a Commercial Loan Officer and Assistant Branch Manager for the Philadelphia National Bank in Pottstown. Then in 1980, Jim returned to his Alma Mater becoming the Supervisor of Accounting/Assistant Business Administrator before being hired as the Business Administrator/Board Secretary in 1968 until his retirement in June of 2006. Therese Rinaldi, DPM, graduated from Pottstown High School in 1979. After high school, Therese earned her Bachelor of Science degree in Nursing from Widener University. In 1989 she earned her Degree of Doctor of Podiatric Medicine from the Pennsylvania College of Podiatric Medicine. Therese began her medical career as a Staff Registered Nurse at Pennsylvania Hospital before moving to the Skilled Nursing Inc. as a Critical Care Nursing Contractor. After earning her Doctorate, she became a Podiatric Surgical Resident at what is now known as Washington Hospital Center. In 1990, she returned to Pottstown as a Director and Surgeon for the Pottstown Foot and Ankle Center before becoming a Partner and Practitioner at the Foot and Ankle Health Group, PC in Pottstown, Royersford and Boyertown. Jonathan C. Corson graduated from Pottstown High School in 1982. He is currently a Reactor Operator for Arkema Chemicals. Jonathan is extremely active in the Pottstown Community. He is currently serving as the President of the Pottstown NAACP, a position that he has held for the past two years. He is also a Pennsylvania State Constable serving since 2013 and serving on the Pottstown Human Relations Commission. From 1980 through 2000, Jonathan served as a Trustee for the Church of the Living God where he played the organ and was a drummer. Other community activities include serving on the Grants Committee for the Pottstown Area Health and Wellness Foundation, Co-Captain for the American Cancer Society Relay for Life, a Board Member for the Ricketts Community Center and participated in the Foundation for Pottstown Education’s Dancing with the Stars. Heather M. Thiret is a member of the Class of 1991. Heather earned her Bachelor of Science degree from West Chester University and holds a PA Teaching Certificate. She is currently working on her Master’s Degree in Leadership through Duquesne University in Pittsburgh. She entered the service in 1992 and has spent 25 years, 10 as enlisted and 15 as an officer. Heather holds a ranking of Major in the US Army and has received several honors including a Bronze Star Medal. She has also served as a TAC Officer/Instructor at the OCS Officer Candidate School Academy from 2010-2013. She is currently the Officer In Charge of Military Ascensions Vital to National Interest Program in Fort Belvoir, VA. Heather has been active in the Veterans Outreach Program/Homeless Vets and the Big Brothers/Big Sisters of America.